Hostels in Sydney are expensive. Since I started visiting the city, I’ve seen hostel prices skyrocket as just the cost of living in Australia has gone up. Even when you factor in the favorable exchange rate right now, it’s just expensive to get a bed here, especially at some of the larger, more upscale hostels. However, with a little planning, you can make sure you’re getting the most bang for your buck. 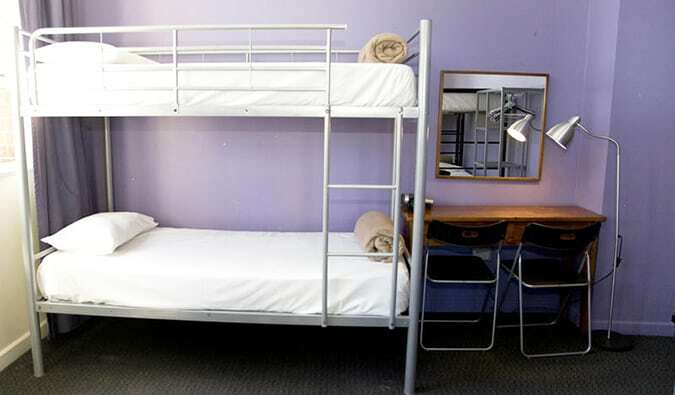 The cheapest hostels in Sydney are found in the King’s Cross area. 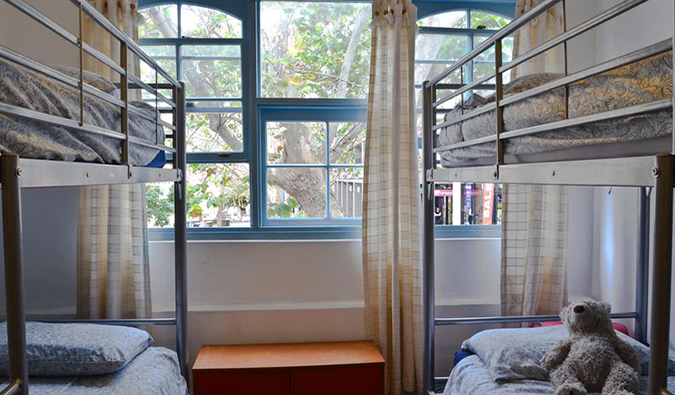 An eight-bed dorm starts around AU$26, while a four-bed dorm starts around AU$33. Private rooms range between AU$80-120 per night, depending on things such as location and whether the bathroom is shared or private. I ike this hostel because it’s social. The staff hosts plenty of activities (beer pong, BBQs, pancake breakfasts). There’s free breakfast, all-day coffee and tea, and different activities every night. The beds are comfy and soft, showers are kept clean, and the room lockers are huge. Hump Backpackers is in the Kings Cross area, surrounded by restaurants, shops, and bars so there’s a bunch of things to do in the area. Heads up: you have to be 18-35 years old to stay here. —-> Click here to book your stay at Hump Backpackers! This hostel is located on the upper floors of a historic bar and restaurant that has been around since 1881 (which, for Australia, is damn old!). There’s no real common space, and the kitchen is basically a toaster but you’re very near Chinatown so there are cheap eats nearby. 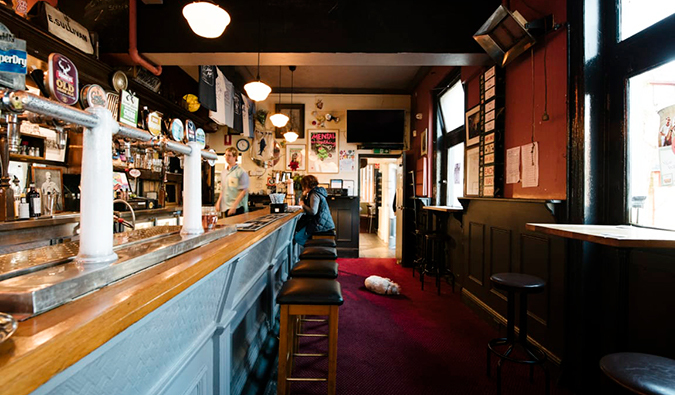 The downstairs bar is always lively and they play incredible blues music on Saturday nights. The rooms themselves are pretty small with simple finishings. Its location near Chinatown and Central Station makes it one of the cheaper places to stay in town. Darling Harbour is just a five minute walk. —-> Click here to book your stay at Lord Wolseley! The staff at this hostel are the absolute best! They are always the most friendly and helpful I encounter in the city. Asylum is close to Kings Cross station, and it’s just a 30-minute walk to the Opera House and the Botanic Gardens. Security is first rate, with two locked front doors and security cameras. The dorms are huge (but they fit maximum eight people) and all have their own ensuite bathroom. There are common areas inside and outside and free breakfast each day. Look for the hostel’s rescue dog, Bella. She’s a cutie. 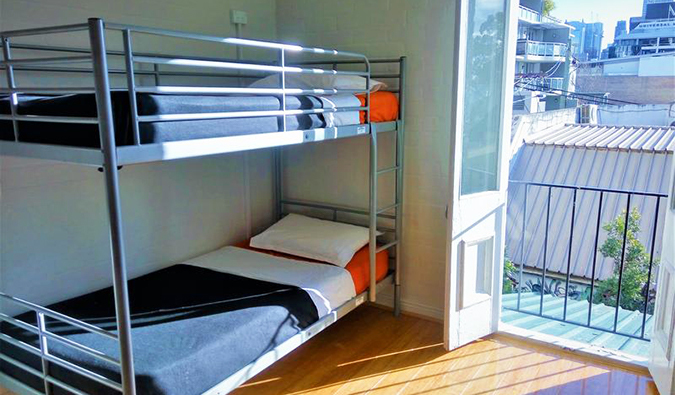 —-> Click here to book your stay at Asylum Sydney Backpackers Hostel! This is another fun hostel, with a very lively social scene! There’s a party every night, a movie room, yoga classes, and a rooftop BBQ. Take the spiral staircase to the basement, and you’ll find a fully-equipped chill out zone with pool tables and even a Playstation center. You get a free hot breakfast at the Mad Monkey Restaurant (which is delicious) each morning. 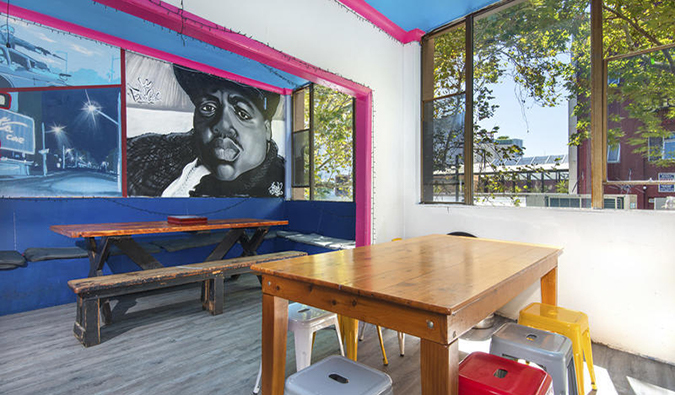 Honestly, there’s so much to do at this hostel you might find it difficult to leave – but just beyond the front door is some of Sydney’s best bars, clubs, and restaurants. (The hostel itself is on a quiet street, though.) You have to be 18 to 35 to stay here. —-> Click here to book your stay at Kings Cross Backpackers! 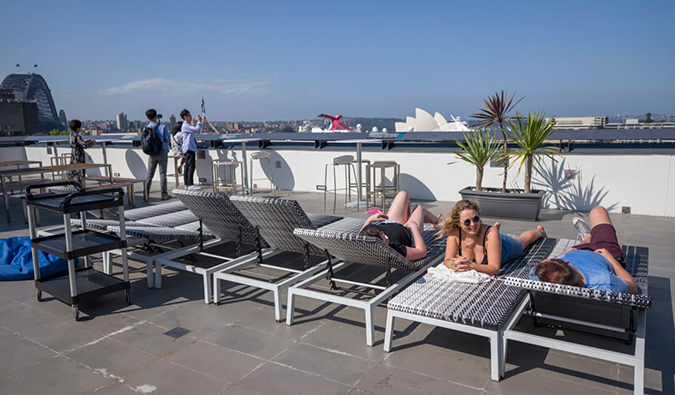 This is the only hostel in city’s historic harbourside area (The Rocks), and it has unreal rooftop panoramic views over the city and the famous Opera House. Sydney Harbor Bridge, Sydney Harbor, and Luna Park are also within walking distance. The rooms are incredibly spacious, and each bed comes with its own reading light. There’s also a large kitchen, several communal areas (including the excellent rooftop terrace), and even a grocery store on-site. To me, this is the best hostel in Sydney! 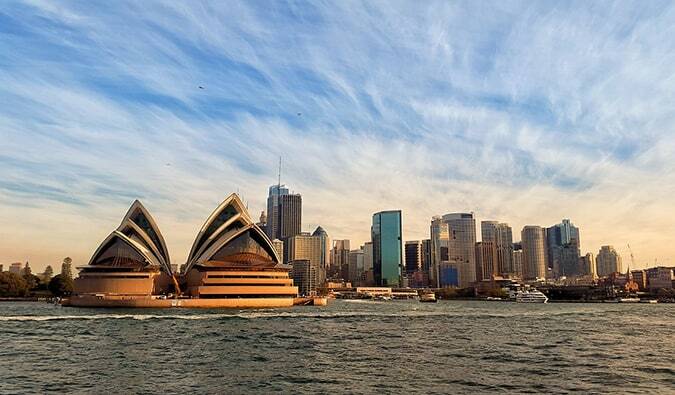 —-> Click here to book your stay at Sydney Harbor YHA! A budget, “boutique” spot in Surry Hills, Big Hostel attracts is centrally located and I love the roof terrace with its super views over the city. They also have sundeck with a beautiful garden. You can BBQ up there as well. There’s 24/7 free coffee and tea, and breakfast is included. The kitchen has lots of space for your groceries. The rooms are are huge and the pillows are super cozy but there’s no lockers and metal frames creak a bit. —-> Click here to book your stay at Big Hostel! This hostel in Potts Point (a happening neighborhood) is run by two sisters, Effie and Sasha. The rooms are pretty standard without a lot of ammenities but the hostel is super homey and feels like you’re staying with family. The hostel has a trivia and pancake night too. Potts Point is one of the most cosmopolitan parts of Sydney. I really dig staying here. It’s a lot more relaxed than most of the other hostels in the city. —-> Click here to book your stay at Blue Parrot Backpackers! Soft beds, clean showers with great water pressure, and free breakfasts make Mad Monkey Backpackers awesome. I also like the yoga classes on Wednesdays and access to a local gym you get. The staff organizes activities and nights out (including a traditional Australian BBQ). One of the downsides is that the common areas and kitchen are small. It’s nearly impossible to cook while others are around. But the central location, friendly staff, and awesome ammentities make this one of my favorite places to stay. 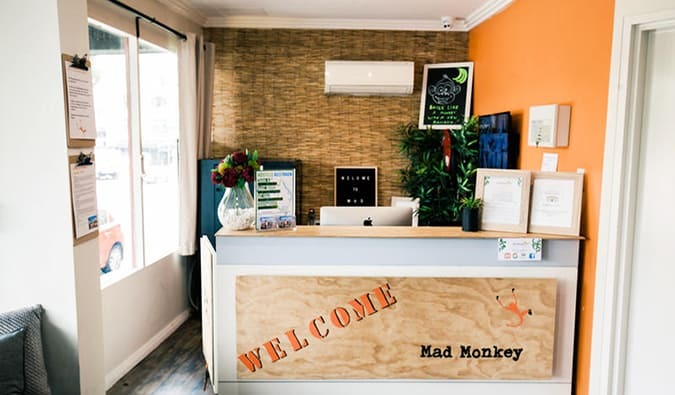 —-> Click here to book your stay at Mad Monkey Backpackers on Broadway! Wake Up! is, in many ways, like a backpacker hotel. With its eight floors, hyper-trendy and clean look, and small common areas, you might think it would be hard to meet people. The large size does make it sort of hard to meet people outside the common areas or your room, but the big bar downstairs (biggest night is Monday) lets you meet all the people you see coming and going. I really liked my time there, and I especially enjoyed the high water pressure in the showers and un-creaky beds. The hostel is located just next to the Central Station so it’s easy to get to and from the airport. Book on their directly to save some money as they often have deals. —-> Click here to book your stay at Wake Up! Sydney! If you love the beach, you can’t beat this place – it is just seconds from the sand! 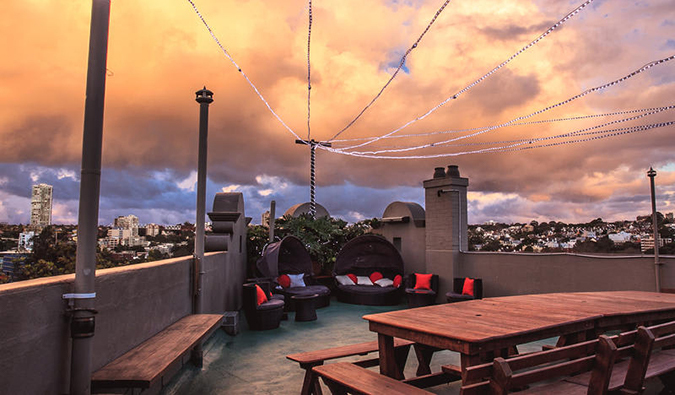 There’s an awesome rooftop space overlooking Bondi Beach. The hostel offers free surfboards. There are also free yoga classes, walking tours, and other fitness activities. If you’re there Friday night, don’t miss the BBQ party on the rooftop! The rooms are comfy and the showers just fine. 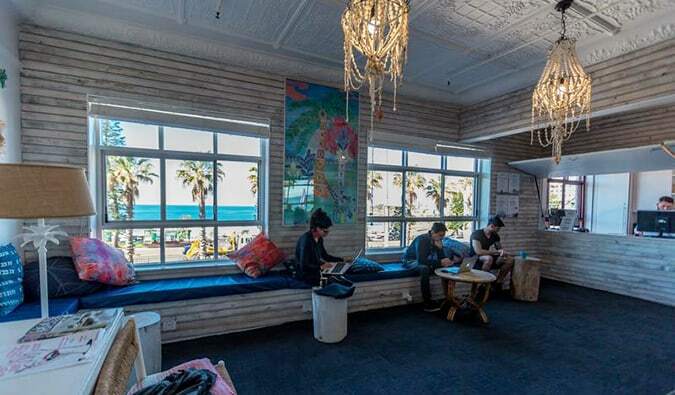 —-> Click here to book your stay at Bondi Backpackers! There are a lot of amazing hostels in Sydney, but to me, these places above are the best hostels in the city. They offer all the things that I think are important when picking a great hostel. 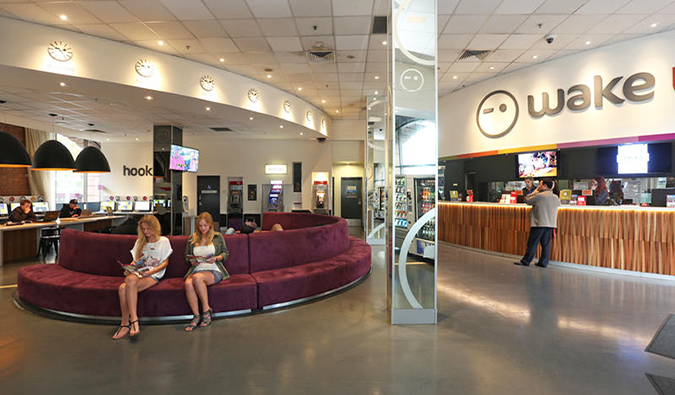 If you stay in any of these hostels while in Sydney, you won’t go wrong! Looking for more information on visiting Sydney? Check out my in-depth destination guide to Sydney with more tips on what to see and do, costs, ways to save, and much, much more! The post My Top 10 Hostels in Sydney in 2019 appeared first on Nomadic Matt's Travel Site.